The information about this bug in Launchpad is automatically pulled daily from the remote bug. This information was last pulled on 2018-11-24. Window title switch to arial font after using Synaptic, so after have updated or installed some packages. Doesn't seem to happen in other occasions. Using unity-2d daily-ppa in Oneiric. With the latest release of Unity 2D in Oneiric I cannot reproduce that issue. Is it still happening for you Lucazade? I'm not sure how to trigger it, but I still get that font with up-to-date Oneiric. Banshee it is. Starting Banshee immediately and permanently (for the session) changes the window title font. I'm seeing this bug and I have neither used Synaptic nor started Banshee (in this session). Will check later whether it is the case for all windows for a new session. I'm also concerned by this bug (today) but I'm not using any ppa. I don't use synaptic neither. But it happened after running "apt-get update" and "apt-get upgrade". So it seems to be related to update process. I was wrong in my last comment. The issue posted in the blog has nothing to do with this bug, because the font is specified as "Ubuntu Bold 11", so the font family doesn't contain any space. unity-2d-panel: [DEBUG] Font name: "Ubuntu Bold 11"
unity-2d-panel: [DEBUG] Font name: ""
Some more info, as I reproduced the bug again: the launcher is invoking the LookupExtended DBus method on the /org/gnome/GConf/Database/0 object, and that fails. However gconftool-2 works, and it's invoking its methods on the /org/gnome/GConf/Database/2 object. This causes gconfd to reload its configuration, and to advertise the DB under a new D-Bus object path. Existing GConfClient instances are not notified of the change in object path, and therefore all the APIs invoked through them simply fail. In Unity2d, we never cache the GConfClient instance (which is properly obtained with gconf_client_get_default() and unref'ed every time we retrieve a value), so the problem is in the libgconf2 itself. - Make GConfClient track the DB object path changes, and readjust its internal structures consequently. This is the proper solution, but it might involve changing gconfd as well and add a D-Bus signal from it. - gconf_client_get_default(), on the first invocation, creates a new GObject *and* references it; therefore, this object is never destroyed. A possible solution is to change g_object_ref() into a g_object_weak_ref(), so the GConfClient is properly destroyed when no client is using it. @Thanks Alberto for taking care of this bug! 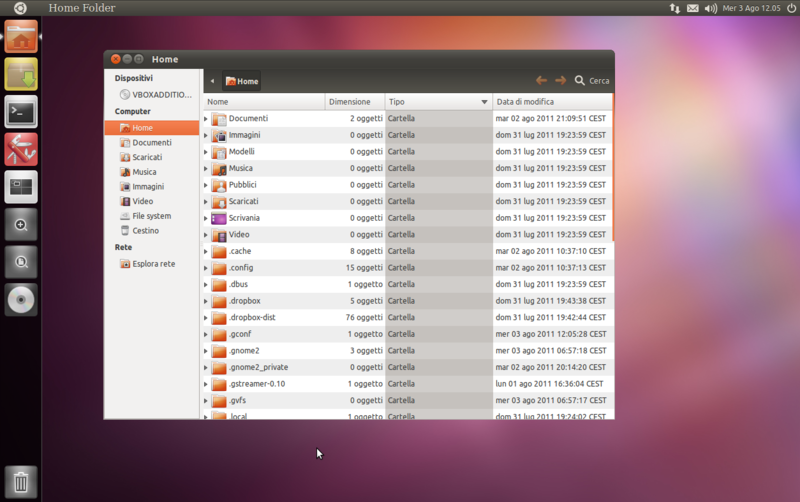 I thought with migration to GNOME3 we should use gsettings, not gconf. Is it planned to port Unity-2d to gsettings in Oneiric? Unity-2d has already migrated to gsettings if you use the daily ppa, for both natty and oneiric. You will see anyway also old gconf settings because are not removed automatically. Yes, unity-2d is using GSettings wherever possible. Unfortunately metacity is still using GConf, and unity-2d needs to read the name of the window title font from metacity: that's why we are still using GConf in that case. I am experiencing this as well. I did use synaptic yesterday but not today. I use neither Synaptic not Banshee. Just got this after restart. Unity-2D 4.4.0-0ubuntu1, Ubuntu Oneiric. @lucazade: glad to hear that it's not reproducible for you, but unfortunately we didn't fix it yet and I could still reproduce it this morning. Anyway, now I think I'm on the good track to fix it. Yep, ignore that comment.... bug is still present.